Breakfast and afternoon tea with home made cakes are both served in the visitors’ living/dining room. Cooked by an experienced, qualified, chef, all our food is skilfully prepared in house and beautifully presented. Fresh fruit, vegetables and herbs are harvested from the garden, and used wherever possible. We have asparagus, broccoli, leeks and lettuces, parsley, thyme, rosemary and sage, strawberries, loganberries, rhubarb and blackcurrants to name a few. We also have several friendly chickens who produce eggs for visitors’ consumption. 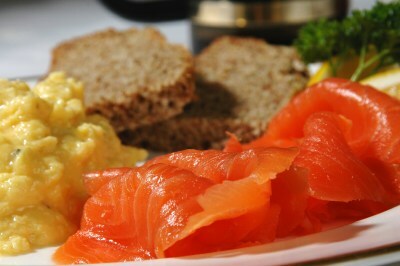 Breakfast includes a wide selection of buffet items, attractively served, and a varied menu of hot dishes to your choice; smoked salmon and scrambled eggs highly recommended. There is generally a choice of 10 menu items for both vegetarians and non-vegetarians. Victorian style afternoon and deluxe teas are served in front of the wood burning stove in the main hall in winter and on one of the patios in the garden in summer. There is a choice of standard, gourmet or cream teas. Please pre-book at least one week in advance. We are happy to discuss any special dietary requirements. Please see the whole gallery of our delicious food here.